Thursday’s release of 2016 American Community Survey (ACS) data allows us to fill in the blanks for race and ethnic groups that were not covered in Tuesday’s Census Bureau report on income, poverty, and health insurance coverage in 2016. ACS is an annual nationwide survey that provides detailed demographic, social, and economic data for smaller populations like Native Americans and the thirteen distinct ethnic groups that make up the Asian American population. For the sake of comparability, in this blog post, the national estimates of median household income and poverty that I refer to are from the ACS. 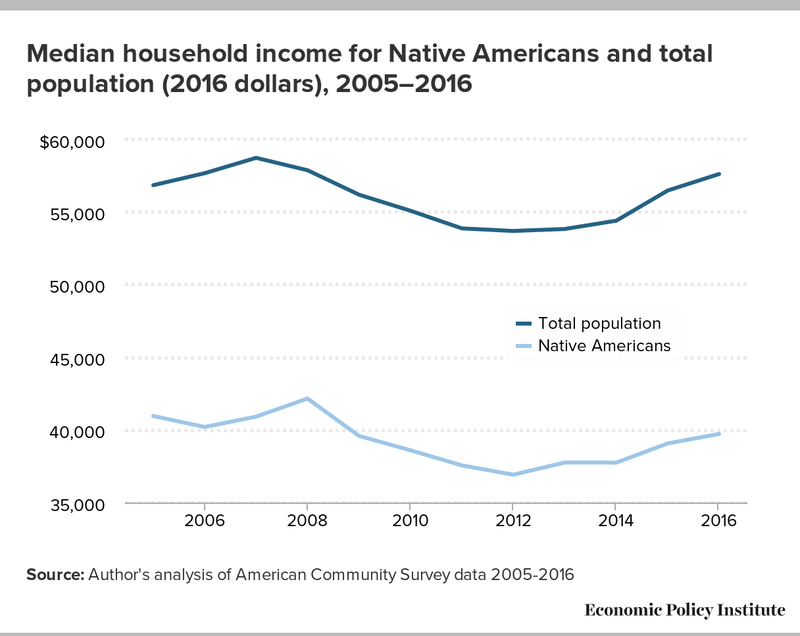 Between 2015 and 2016, the real median household income for Native Americans increased 1.8 percent to $39,719. This was 69 percent of the national average in 2016 and $1,194 (-2.9 percent) lower than the group’s 2007 pre-recession level. While this data comes from a different source than Tuesday’s data on household income and covers a slightly different survey period, it suggests that Native American median household income is similar to that of black households, but Native American households experienced much slower income growth than blacks over the last year. 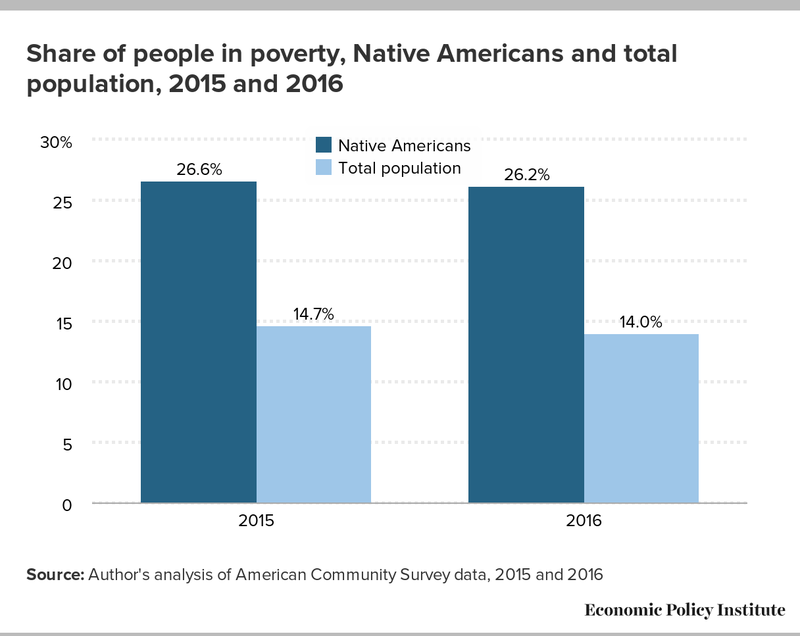 Despite the income gains, poverty among all Native Americans was virtually unchanged between 2015 and 2016 (from 26.6 to 26.2 percent) and 33.8 percent of Native American children lived in poverty in 2016—the same as in 2015. Both rates are similar to those reported for blacks in the Current Population Survey, though slightly higher. The rate of poverty among Native Americans was nearly double the national average for all people and 1.7 times higher for children. According to my prior analysis of Tuesday’s Census report, Asian Americans were the only group for whom the increase in real median household income between 2015 and 2016 was statistically insignificant, but like non-Hispanic white and black households, still had not recovered their 2007 income level. The 2016 ACS data shows the variance in income across the different Asian ethnic populations, as well as their disparate rates of recovery. In 2016, median household income among Asian ethnic groups ranged from $110,026 for Indians to $38,971 for the Burmese. Indians also had the most income growth since 2007 (13.4 percent), although eight of the fourteen ethnic groups with reported income in 2007 had surpassed their 2007 income level. The wide range of incomes and income growth across Asian ethnic groups are also generally reflected in differences in poverty rates. 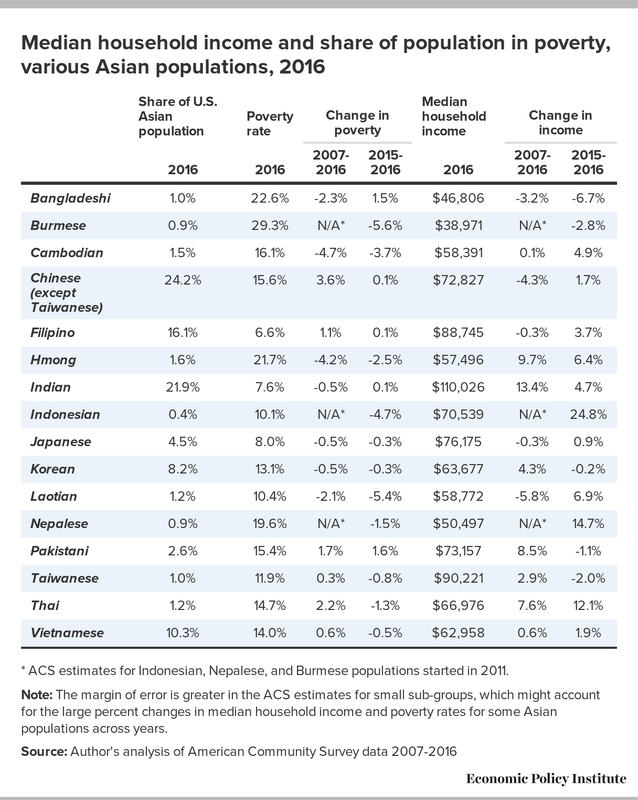 Three groups—Indians (7.6 percent), Filipinos (6.6 percent) and Japanese (8.0 percent)— had poverty rates of 8 percent or lower, while over one-fourth of the Burmese (29.3 percent) and more than one-fifth of the Bangladeshi (22.6 percent) and Hmong (21.7 percent) populations lived in poverty. * ACS estimates for Indonesian, Nepalese, and Burmese populations started in 2011. Note: The margin of error is greater in the ACS estimates for small sub-groups, which might account for the large percent changes in median household income and poverty rates for some Asian populations across years. Together with the 2016 Income, Poverty and Health Insurance Coverage report, the 2016 ACS data provide a more complete picture of the economic status of America’s various racial and ethnic groups. This information helps to address the sense of “invisibility” felt by many of these groups, provides critical information for the states and local communities where these populations are concentrated and expands the scope for evaluating the impact of national policies. This data also show that while the household income gains in 2016 were mostly good news, some racial and ethnic groups are still facing a challenging recovery.